To keep the roads safe for everybody, all drivers must not only drive carefully, but also drive defensively and anticipate the movements of those around them. With vehicles of all different sizes and capabilities on the highways, freeways, and even downtown roads, it takes a special attention to safety in order to avoid accident and injuries. Those driving smaller vehicles can take safety precautions whenever they are driving next to a large truck. Trucks carry a lot more weight and have a harder time turning than a smaller vehicle. When a truck is making a right turn, never try to pass it on the right side as your car could end up smashed between the curb and the truck if the truck driver cannot see you. When a truck is turning left, smaller vehicles should back off and give the driver room to maneuver without having to stop traffic. It is more difficult for a large truck to stop quickly because of the weight that it is carrying behind. If a car pulls out right in front of a truck and slows down, the results can be disastrous. Drivers should always leave a good amount of space between their vehicles and a large truck, and always give truck drivers extra time to slow down, particularly on hills or downward slopes. Be Alert Driving Near Trucks! When it comes down to sharing the road with big trucks and other vehicles, it’s simply not worth it to take risky chances just to save a little time. Drivers should slow down, be careful, and always be alert when they are on the road. 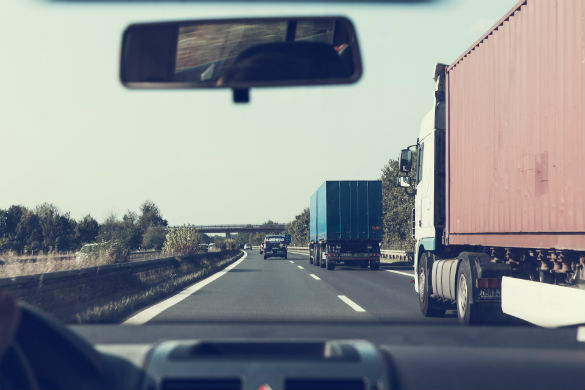 When you practice safe driving, and are aware of other drivers, particularly truckers, your chances of being in an accident greatly decreases.